It’s not often that people cheer for snakes, but the crowds at the Coaldale ice arena are more than supportive of the Copperheads. The Coaldale Copperheads are a Heritage Junior “B” Hockey League (HJHL) team based out of the Coaldale arena. The team has been playing on Coaldale ice for 11 seasons, where they’ve been able to enjoy considerable support from the community. The team originally operated as part of a HJHL team in Lethbridge, under the name Southern Express. Kevin Wiebe, Copperheads president, said at the time, the team was struggling, and had money issues. As he and Kelly Wiebe had a son who was playing on the team at the time, Kevin tried to help out by contacting Coaldale businesses on the team’s behalf. Kevin gained approval from the league president to move the team to Coaldale, something they had “whole heatedly approved of and thought was a good idea.” The Lethbridge team was disbanded, and the Copperheads hit the ice. “With the co-operation of some of the immense teams in town here, we were able to secure an ice time for our games, to get a schedule started. A lot of co-operation from the community to get that going, like the local men’s hockey teams helped us out, Coaldale minor hockey helped us out, and there were a lot of people, at the time, that kind of came together and made it happen,” said Kevin. Unlike the Southern Express — which played out of different ice arenas in southern Alberta for their home games — the Copperheads claimed the Coaldale ice arena as their home base. 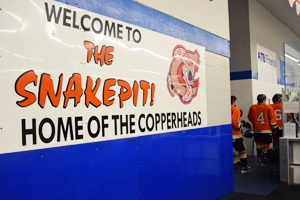 With the Copperheads and the Coaldale Minor Hockey League teams, the Cobras, claiming the arena as home base, fans soon began dubbing it with the moniker the Snakepit. The Copperheads are one of six teams that play in the south division of the HJHL, and have players that come from across southern Alberta. This season, 55 players tried out for 21 positions on the team, with some coming from as far away as Airdrie to play. Kelly credits the influx of players hoping to wear the Copperheads colours partly on the team’s reputation, as they won the HJHL championship in the 2014-15 season. She also notes being so close to Lethbridge, the players — ages 17-21 years old — have access to post-secondary school. Depending on the year, about 75 per cent of Copperheads players are attending post-secondary school, with the others in trades or already working. “We draw a lot of players going to school in the area. So they come down here in the fall, then they see we have a junior program or heard about it — most guys know about it already, and then they come to try out,” said Kelly. Since the first season, they have gone from renting vans for travel to getting a chartered bus. Equipment once stored at the Wiebe’s house and lugged to away games in a cargo trailer can now be stored in its own storage area and in the chartered bus. The Copperheads also sponsored it’s own changing room last. In addition to hockey, the team volunteers in the community. Provided that they don’t have games that night, they are regular fixtures at the Night of Lights and Skating with Santa events in town. “The community gives a ton to the Copperheads, so the Copperheads want to give a ton back to the community,” said Kevin. “It’s a mutual thing; the community is really behind us so we feel we should be really behind the community as well.